The eye-catching display of the princess bedroom with the mood set in pink love and multicolored mélange of Barbie Kit Furniture. Birthday Cake with a photo sheet, exactly what you dream the Snow White, Jasmine, Cinderella would have ever used or still use in the pink Fairy Disney world. The lovely stool, miniature wardrobes, and the tiny bathtub is the fantasy everyone wants to live in. 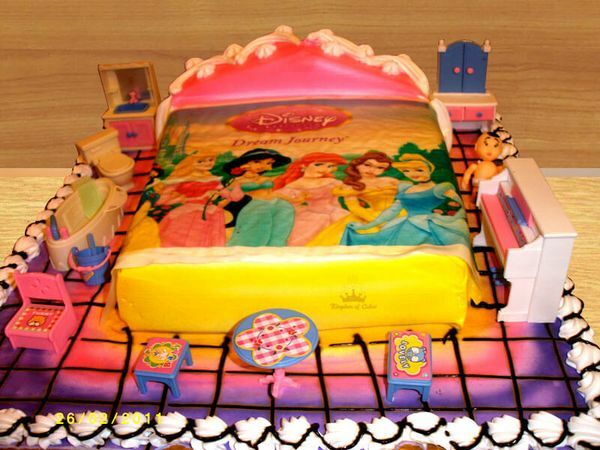 It is the finest Royal Disney Princess Bedroom Suite Birthday cake to cut on the most special occasions and adorn the surrounding in the Barbie theme.